By Joe the Engineer from Birmingham, AL. Skin Protective Ointment helps treat and prevent rash associated with diaper use or continued exposure to feces, urine or both. Protects skin from minor irritation associated with diaper dermatitis and exposure to feces and urine, and helps seal out wetness. I bought this product for my elderly father. It protects his skin and it is a great addition to his daily care. Caregiver. Elderly. Average Health. former Nursing Home CNA. Used to cut moisture and resulting yeast infections all over the body. Just wish it was a little less expensive. Safe. High Quality. Good Value. Hospital used it, and provided several tubes upon discharge. Since then, I have been using it at home, and finally bought several tubes from you. Same great product (it works) on my legs and feet. Great price-way below competitors. Great delivery-two days from order to delivery. Safe. Good Value. High Quality. Effective. Comfortable. Soothing. Protects Skin. Light Fragrance. Elderly. self. disabled. incontinent. Retired R.N.. This is a product that I first encountered while in Rehab following surgery. Following discharge I have continued using it because it is effective, soothing to irritated skin, and it has a light fragrance that is hardly noticed. The product is easy to apply and easy on those of us with limited incomes. 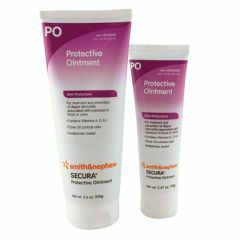 The Secura Protective Ointment - what color is it? I keep ordering and getting the crème (White)too thick, need the blue/green gel. Is this it? will this product PREVENT skin adhesive from adhering to skin? Most skin adhesives probably won't work because the ointment uses clove oil and what appears to be a petrolatum base. You might consider cleaning of any Secura residue with Witch Hazel and sprinkle on a light coating of Stomahesive (a pectin)and blow or brush off any excess before applying the adhesive. The Stomahesive works with many body parts, so it's worth a try. I think it would. It's light but leaves a light coating on your skin so i don't think adhesive would stick with this product on. Yes, this will keep pretty much anything from sticking. It does a great job of helping prevent bed sores and irritations and keeps one from sticking to the bed pads. It does seem more watery than the other similar product but it seems to separate more from the heat so I keep the extras in a cool area of the house. Not as much separation that way. does this product still exist? yes it does, but it is to watery so it runs to easy didnt Like IT as the first one I used, it was very THICK. However smells great. yes and you buy it right on this site. was it not available for a while that you would be asking? It still exists.